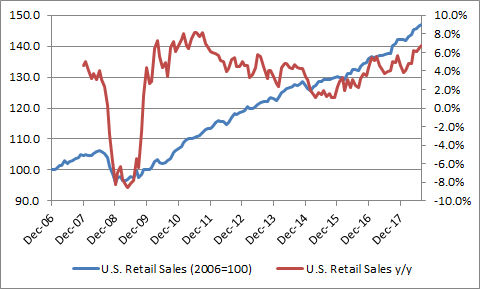 Key takeaway is that the retail sales were softer in August but the trend is still positive. Consumers maybe pausing after a strong spending in July. The seasonally adjusted Advanced Retail Sales for the month of August 2018 came a bit softer than expected. The advanced estimates came at $509.0 billion, which is an increase of 0.1% from the previous month and 6.6% increase from August 2017 (see Fig. 1). The experts were estimating a monthly increase of +0.4%. The August increase is also below the 6-month moving average increase of +0.6%. The bulk of increase came from gasoline stores, which increased by +1.6% from previous month and by +20.3% year-over-year, and non-store retailers (eCommerce), which increased by +1.4% from previous month and +10.4% year-over-year. 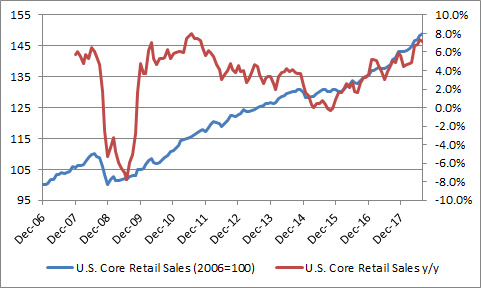 The Core Advanced Retails Sales (excluding automobiles) increased to $407.3 billion, an increase of +0.3% from previous month and an increase of +7.1% from last year. The market was expecting a monthly increase of +0.5% for the Core Retail Sales. The 6-month moving average is +0.6% (see Fig. 2). The U.S. import prices for the month of August 2018 declined by -0.6% following a decrease of -0.1^% in July. This is the largest monthly drop since January 2016 and is the third decline in the last 12-month. The year-over-year change is an increase of +3.5% (see Fig 3.). The major contributors were fuel import prices, which decreased by -3.9% from July. The is the smallest first year-over-year increase since March 2018. The non-fuel import prices declined by -0.1%. 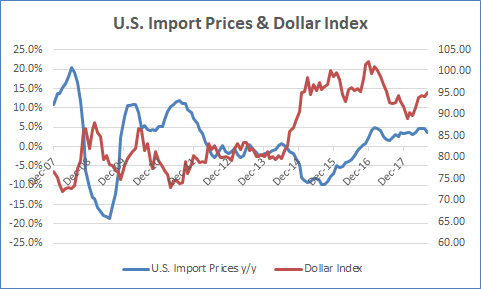 Increase tariffs and the rising U.S. dollar may have played a role in the import prices decline. The U.S. export prices declined by -0.1% from July 2018 but increased by +3.6% year-over-year increase. The year-over-year increase has been falling since June 2018. Non-agriculture export prices declined by -0.2% in August.